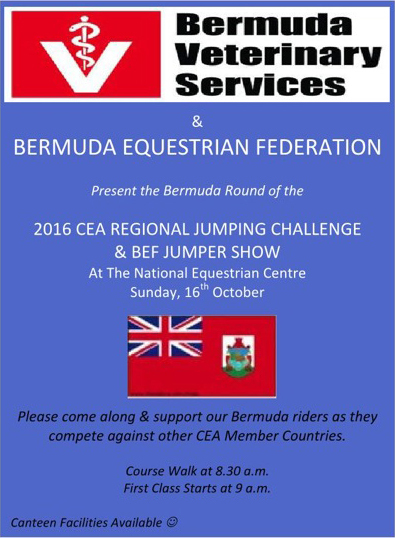 The Bermuda Equestrian Federation advised that Bermuda will be competing in the 2016 CEA Regional Jumping Challenge scheduled to take place this Sunday, 16th October at the National Equestrian Centre. 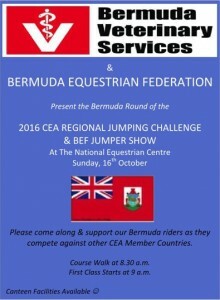 “By way of background, the Caribbean Equestrian Association [CEA] was formed in 1997 and Bermuda has been a member country since 1999,” a spokesperson said. “Other member countries include Jamaica, Barbados, Cayman Islands, Haiti, and Trinidad and Tobago. “One of the primary goals of the CEA is to encourage equestrian activities within the region by promotion of international and/or intra-Caribbean events. “The format for this year’s event, will see adults and children competing over two specific rounds of jumping at 3 different heights, the highest being 1 meter. “This competition is most unique as there is no distinction between age and gender. Adults and children, males and females all have the opportunity to compete against each other.